Don’t get me wrong. 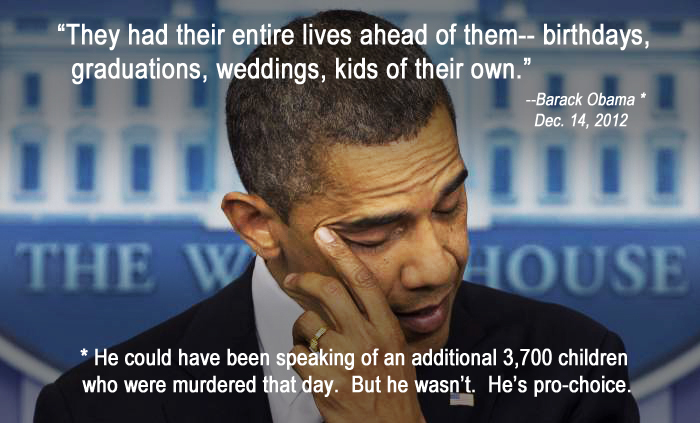 I’m not suggesting there really were tears in Barack Obama’s eyes during his Sandy Hook press conference. 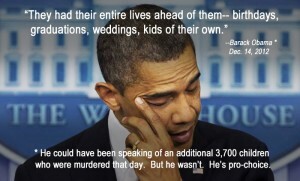 After all, he has demonstrated utter contempt for human life from the very start of his career. Remember, this is someone who, as a state senator, tried repeatedly to decriminalize the murder of newborn children. Recall that later, as a US senator, he made chilling remarks about Terri Schindler Schiavo, saying it was “a mistake” to allow her family to petition Congress in an effort to save the disabled woman from court-ordered starvation and dehydration.Now consider what Obama’s heartlessness means for the rest of us: the inevitable denial of medical care when bureaucrats decide we’re too sick, injured or old. This is the lynchpin of what he considers his greatest achievement, a government-run health care system. But like everything else he’s inaugurated, Obamacare is a travesty; it cannot possibly stave off insolvency without denying medical care to the very persons who need it most. Unless, of course, “care” includes euthanasia. The Democrat Party, along with much of the public, has long considered abortion to be health care. And what is abortion if not prenatal euthanasia? Indeed, the denial of lifesaving treatment implicit under Obamacare is merely a passive form of euthanasia. Either way, active or passive, the objective is the same: death. Obama and his fellow atheists never will admit the truth about today’s mass murders, whether they occur in public schools, abortion mills or nursing homes: They are symptomatic of a culture they themselves have wrought, a culture that is anti-human precisely because it repudiates Judeo-Christian tradition. Right and wrong are matters of opinion; life has no purpose; I come first. The only solution to such violence is obvious to anyone with a properly formed conscience. It’s the same solution Mother Teresa offered when asked how we might prevent war: Love your children. But as we see, it goes unheeded by a culture bent on contracepting, aborting, sodomizing and euthanizing itself out of existence. Is it Appropriate to Link Sandy Hook and Abortion?